For all of the great things Folsom has to offer, from beautiful trails and parks, great restaurants and shops, historic sites, and great schools, the one thing we suffer from, and perhaps it's because of all of those great amenities, is traffic congestion. Now, it's not as bad as the Bay Area, or even Sacramento, but travel across town can get pretty gnarly at times, in part because traffic control systems haven't kept up with Folsom's growth. Folsom homes are hot items, and with the development of Folsom Ranch, more are on the way. Responding to current and anticipating future needs, the City of Folsom has created a new Traffic Management Center. 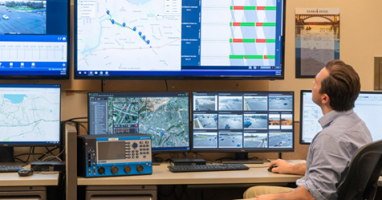 This new office allows Folsom traffic engineering staff to monitor traffic signal operations in real time, and make adjustments of signals to provide immediate response for any malfunctions on the city's traffic network system. The Public Works department is continuing to add intelligent transportation system features along Folsom's main arteries. New cameras and motion sensors give real-time data to help controllers make adjustments to signal timing and coordination, easing traffic. I understand they are also working on a solution for the intersection of East Bidwell at Iron Point to increase traffic flow there as well. Keep it up Folsom, we've got the best city employees, from manager on down through the ranks!